I don't think my first comment went through, so trying again. I love the shirt, it's totally my style and I agree it's hard to find that shirt style. And I know I've said before, that I love the olive green jacket, such a great color and it goes so well with this outfit! 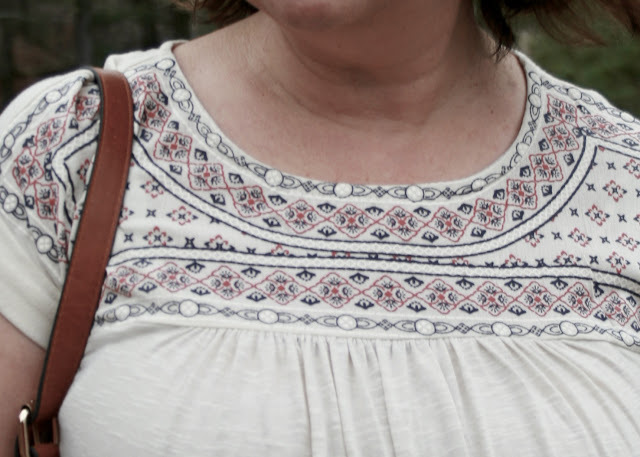 I bought a really pretty embroidered shirt last summer, wore it once and it shrunk after I washed it!! Oh no! Don't you hate when that happens. That happens to me a lot, even when I'm super careful and wash it according to the instructions. I will be very careful with this top. Thanks so much for your comment. Your right, your first one didn't go through cause I didn't see it! Those sandals are so cute. 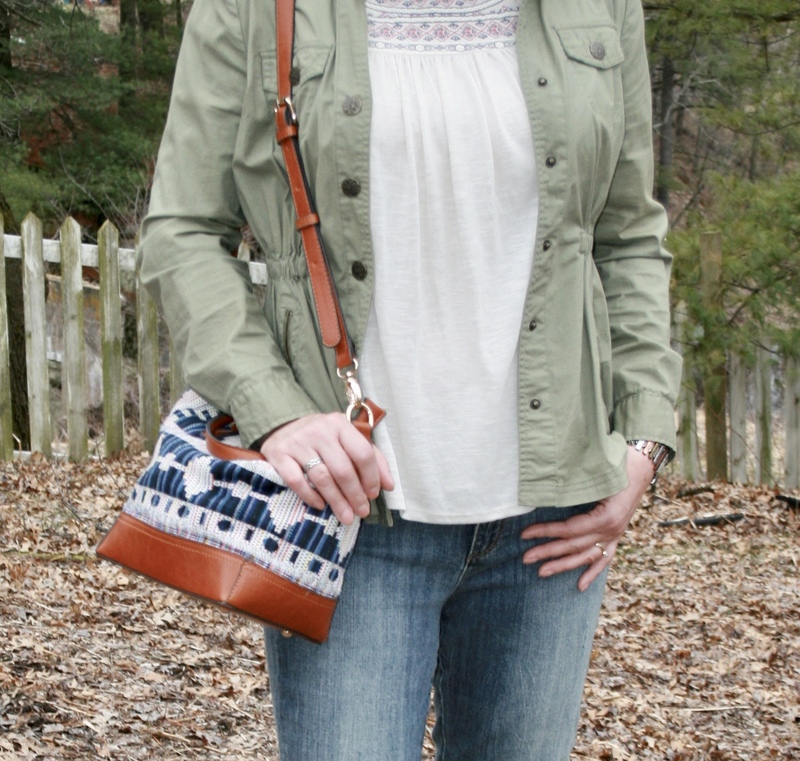 Embroidered shirts, jackets.. are big trends this spring - love how you paired it with the utility jacket. Thanks so much for joining the Fabulous Friday Link Up. Oh, so spooky. I bought a utility jacket last week and have just done a post on it. We should have done a collab on "how I wear my ..."!! Yours is a great look, I'm a newbie to them and am feeling my way. Anyway, guess who I NEARLY met? Our mate Karen!!! It's a "nearly-meet" as she arrives in London the day after I leave - how sad is that :-(. Oh that would have been fun, I'd love to do a collaboration with you! I am so sad that you're going to miss Karen when she is London. What are the odds of that? Let's give our collaboration some thought! Thanks Karen. I have two utility jackets. This one is more fit and polished and the other one is kind of a sloppy one that I tend to use more for rainy days/travel. I so agree with you about the super skinny jeans. They were fun for awhile, but constantly pulling them up and/or the tightness was a pain. Thanks so much! And you're welcome! Do they still have the Sky+Belle brand at JC Penney?! I do like Liz Claiborne and Worthington too though. Such a cute top and great way to style it. I have the blush pink Neo Adidas sneakers and love them! Yes they do still have that brand but unfortunately they don't offer it at my store and only on-line. Yes, I saw you had the blush sneakers, I almost bought those...I still want them too, but I'm trying to resist. I don't think I'd get a lot of wear out of them, even though they are so cute! What a pretty find! I love how you styled it with the military jacket. Thank you so much for linking your pretty outfits to On Mondays We Link-Up! Such a pretty top. Looking good! Thanks for joining the Top of the World Style linkup party. Cute weekend look! You're welcome! Thanks so much!